Tube Craft is a futuristic racing game that takes place in a 3D tubular environnement. The object of the game is to drive through the tubes as fast as you can and try to get the best times. You can also create your own courses using the level editor included inside the game ! The soundtrack composed by Jared Johnson sounds futuristic and retro at the same time, which perfectly fits the game and creates a retro sci-fi atmosphere. This is a remake/sequel of the original Blue Guy created by Nitromatic. It’s a simple, yet very efficient and indie-styled platform game that requires precision, skills and patience. And a Windows computer. It features 36 screens, 3 zones and 3 boss battles. I’m quite proud of this game actually, as it is an efficient platformer and a good tribute to the original game. Rotative is, as the title suggests, a reamke of my game Rotator. Unlike rotator, the coding is way better, there are more (25) levels and the interface is comfortable. As with Rotator, you have to steer a ball through a maze by rotating the maze, while avoiding hazards. This game includes many objects, such as orbs which open orb doors, and portals which teleport you all over the level. Glovekid and Glovegirl is one of the milestones in the Glovekid series. 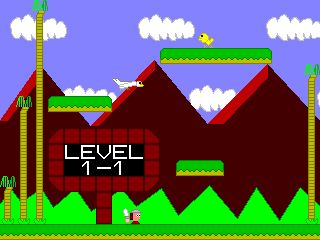 You play as Glovekid or Glovegirl, each with different capacities, running through 20 levels and 10 beautiful worlds. But you’ll have to defeat 10 bosses in order to beat the game ! This game also includes 2 different endings and 2 hidden levels. The time has come. We have reached apocalypse. But you’re more courageous than many other people of your kind : by climbing the endless and deadly Tower of Doomsday, you aim to keep surviving as long as you can. But be careful, the explosion of earth will chase you ! 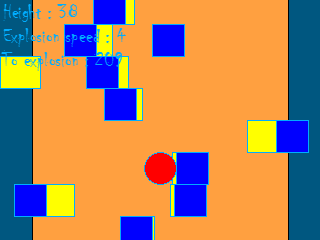 An action-paced arcade game with statistics and a color editor to create your own color themes. EggKnight Adventures is one of the games I am the proudest of. It’s a big, retro-styled, action-paced and polished platform game. You play as the ridiculously cute EggKnight and make him walk through 12 levels within 4 worlds including 4 boss fights. There are even unlockables you can get after beating the game ! 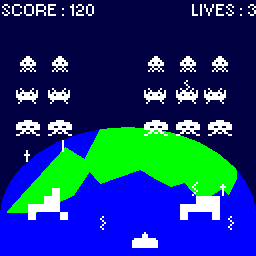 Just another Space Invaders clone. With the skills I had back then, making a near-perfect SI clone is harder that you’d think. But I somewhat did it ! This game includes highscore backtrack and 3 graphical modes : Black and white, cellophane and reflector.